Tonight on Crossfire: the battle lines for 2016. Gov. 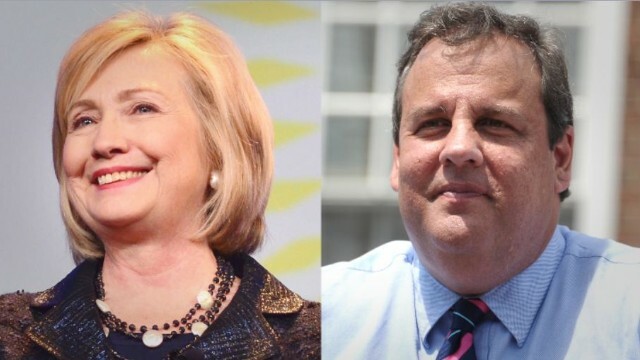 Chris Christie and Hillary Clinton, the two front-runners, already face problems. Between Christie's bridge scandal and Hillary Clinton in the spotlight for Benghazi; the upcoming fight for the White House won't be an easy one. At 6:30pm ET. former House Majority Leader Tom DeLay (R-TX) and Democratic strategist Paul Begala join Newt Gingrich and Stephanie Cutter to debate 2014 & 2016 politics. We want you to weigh in: Whose 2016 chances are more in jeopardy? Vote by tweeting Clinton or Christie using #Crossfire or comment on our Facebook post. View results below or through our Poptip results page. Benghazi has virtually no negative impact for Hillary. Comparing Christie's situation with that is rather foolish. With Benghazi, we have a situation where a decision was made and it didn't turn out well. There was nothing illegal or unethical about the decision. It may even have been the logical decision to make at the time based on the intelligence availabe. But the results were not good. With Christie, we have a situation where an elected official may have misused government power for personal reasons. It wasn't for cash in hand (like Blagojevich) but it was still personal gain (causing pain to a political advesary using government power). The two resonate very differently. Benghazi in the end will be viewed by some as a mistake and some as the correct decision, but the argument will be about which choice was made... not that a choice shouldn't have been made. Clinton didn't do anything illegal... some will just not agree with the choice she made. As time passes, the negative impact will continue to fall and bringing it up will remind people that she WAS the secretary of state and is used to making decisions of great import already. With Christie, bringing it up will remind people that he may have been using government power for personal gain... and will always raise quesions that he may do the same again. Will he send the FBI to investigate political enemies as president? Would that be much different then what he's done as governor? Much different animals. I would be shocked if Benghazi has any negative impact for Hillary in 2016. The Republicans initially cut the security budget before Benghazi. Can either one of them actually help America and the American People bounce back from all the stupid, traitorous, nonsense and damage done to the Real American Economy over the last 2-3 decades? What on God'e green earth does the fact that Bill Clinton negotiated a deal with China have to do with the fact that Hillary is probably going to run in 2016? you must be hard up for dirt to throw at the Democrats – that's the biggest stretch since bungee cords were invented. don't you think that Hilary, a graduate of Yale Law School, and a former Secretary of State has the chops to make her own decisions? This is not life in the trailer park, where a wife might get beaten if she didn't do exactly what her husband wanted. BTW, it's the fact she is a women that is going to get her elected. Why? Because women comprise 53% of the voter pool, and virtually no women will vote for the party that vetoed protecting women from violence. That will leave only 47% of the pool from which the GOP can solicit votes. Seventh grade math will convince you that it isn't possible to get from 47% to 54%. The other factor is that none of the potential GOP candidates that have been rumored about have any where near the gravitas of Hillary. Paul? Looks and talks like Alfred E Neuman. Cruz? DOA with the business community and all moderates. Christie? Dead man walking on the national stage. Rubio? Smarter version of Cruz. Forget the rest of the Elmer Fudd clones, as well. H.W. Bush came up with and negotiated NAFTA. The final deal was not made until after Clinton took office. Steve, Personally I think both parties stink, because over the past several decades, all they've been doing is screwing the American people, by stalling, spending, removing protections and allowing illegal aliens to continue to pour in and American jobs and industry to pour out, and all while collecting their American tax-payer funded pay checks, benefits and whatever else they get on the side from their various lobbyist friends. But, it was President Clinton who got us into bed with China in the first place. Nixon only restored normal diplomatic relations between the US and China, but Clinton is the one who opened up the trade floodgates with China. And both Bill and Hillary were actively involved during their visit to China. Under Clinton jobs to China, Under Bush I & II influx of illegals/cheap labor into the US and jobs to Mexico/NAFTA – Bush started it and it was signed into effect by Clinton. I loved President Reagan at that time, because he brought pride and respect back to our country after those embarrassingly weak Carter years, but unfortunately his shortsighted economic policy sent us down the wrong path. Reaganonomics was a huge mistake. Jeez and the wizards on Wall Street wonder why the American people aren't putting as much money into savings and their 401k plans anymore. Maybe it's because the shortsighted economic policies, from the 1980's to the present, have come back to bite the hands that feed them. I guess the thought of changing from a manufacturing based economy to a service based economy of smoke and mirrors is working out just great? Not! Actually Carol – It's very relevant to most Americans, who like me are angry and frustrated with both parties. It seems to me that over the last 2-3 decades that both parties were always able to distract and polarize voters with insignificant peripheral BS, which gets most voters so caught up in the BS that they lose sight of the bigger picture. It's obvious, isn't it? – But some people just keep trying to keep us distracted and polarized, so they can continue to sell us out. Some time back people went to congress and complained they couldn't qualify for a housing Loan. Now mind you there are regulations that banks has to follow to protect all the people that deposit their savings when put in a bank. Well! The Liberal's decided they would change the rules so those people could now qualify for a housing loan, qualified or not. As a result we had the Housing Mess. And guess who is going to pay the freight? You. Now we have Obama Care. Also a huge mess. When the dust settles guess who is going to pay the freight? You. In the mean time jobs have hit bottom. A long time before any jobs return. Except for part time jobs. Republicans didn’t care when Bush lied about WMDs, nor did they express outrage over 9/11/2001, the Iraq War, or the 13 embassy attacks with 50+ dead under Bush. Their outrage over Benghazi is phony and they are essentially spitting on the graves of those lost in Benghazi for political gain. If Republicans cared so much about embassy security, why did they cut funding for it by millions of dollars? Why didn't they express outrage over the 13 embassy/consulate attacks under Bush? 1. The nonpartisan Accountability Review Board did not find Hillary Rodham Clinton responsible for the Benghazi attacks. Hillary never received the cables requesting more security from Benghazi. 2. Republicans cut millions and millions of dollars in “embassy security.” Cuts that Hillary Clinton called “detrimental” to our security overseas. 3. Over 50 people died from 13 embassy/consulate attacks under George Bush’s Presidency. 4. The Obama Administration did not “cover-up” the Benghazi attacks. Counterterrorism Director Matthew Olsen told Senator Joe Lieberman that Benghazi was a “terrorist attack”. This was only a few days after Susan Rice went on the Sunday morning talk-shows. Therefore, this would have to be the shortest “cover-up” in history. 5. Hillary’s quote, "What difference, at this point, does it make" has been taken out of context. Hillary was referring to the Republican’s obsession with what Susan Rice said, not Benghazi itself. We now know the intelligence communities talking points that Susan Rice presented were incorrect. But to accuse the Administration of intentionally lying (when Counterterrorism Director Matthew Olsen called it a “terrorist attack” only a few days after Susan Rice went on the Sunday morning talk shows) is dishonest. 6. The reason the YouTube video was cited as a possible reason for Benghazi is because violent protests had been erupting throughout the Middle East when Benghazi took place. Some of the protests had to do with the YouTube video, which is why it was originally thought Benghazi was also related to the YouTube video. Embassy attacks are an unfortunate reality in the world and have occurred under every administration in modern times. Security overseas is always risky business, and those who take jobs in dangerous places know the risks. Unfortunately, Republicans cut millions and millions of dollars from embassy security. Hey Wes, were this rabid, psychotic and hypocritical about the 13 embassy attacks and 52 dead Americans when a Republican was president not too long ago? Some how I doubt it. the reason no one investigated attacks under Bush/Clinton is because no one lied about what they were (terrorist attack), or refused to be clear about what their response had been. Neither of them gave weirdly vague stories that was “really” took place was a spontaneous protest over an unseen, stupid video. And them repeated those lies to grieving parents (weeks later) or in a speech to the UN where the “video” was blamed six times ( has the UN speech slipped our memories)? And finally, no ambassadors died during the Bush/Clinton administrations. The figure head for the American people was still there, not being dragged through the streets as Stevens was. "We will move assets to cover that" means that there was a deficiency of assets that needed to be covered. This doesn't really counter my point – actually kind of backs it up. The State Department is not given specific funding for security, they are given a budget (Which was much higher than previous years). What they do with that budget is up to them. Obviously, the person in charge (Hillary) didn't have security as one of her "priorities" and Stevens paid the price. The ambassador asked for security multiple times. They had money/personnel and didn't commit them. In fact, why don't we look deeper into the article I posted and take the fact that Republicans provided much more money in 2011 and 2012 to the State Dept than the Democrats did in previous years. If anything they beefed up the State Department funding. The Republican House cut the administration's request for embassy security funding by 128 million in fiscal 2011 and 331 million in fiscal 2012. After the Benghazi attack, Republicans added more than 2 billion to the budget for embassy security. If Republicans thought that the budget for embassy security was enough, why did they add 2 billion?